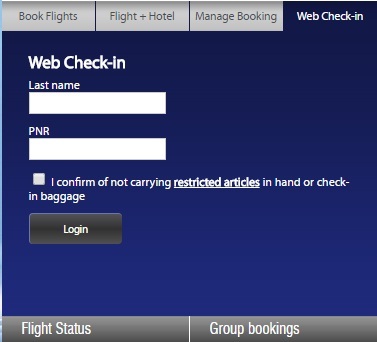 GoAir allows check-in in two ways- Airport Check In at the Counter and Web Check In. The airport Check In begins 2 hours (3 hrs in case of J & K) and reporting time for passengers is atleast 45 mints prior to scheduled departure of flights. This time limit is 90 mints for Jammu and Kashmir and 120 mints for Bagdogra airports. Printed itineraries are also required to be produced. It shall be noted that refunds of PSF and UDF would be initiated only when Customer gives the request for same in writing within 15 caldendar days from date of cancellation or 'No-show'. Go Air Online Check In through its website begins 72 hrs before scheduled departure of flights and continues till 2 hrs before departure. It can be availed only on confirmed tickets and for up to 9 passengers travelling on a PNR. If more than 9 passengers are travelling on a PNR, then web check in can not be used. Despite web check-in, there is a need for passengers to report at least 45 minutes before the scheduled departure of flights so that the valid ID proofs be verified and boarding passes be stamped. For passengers with checked-in baggage, the reporting time is at least 60 minutes. Check-in counters close 45 minutes before flight departure and boarding gate closes 25 minutes before. Who can not avail Go Air web check in? Passengers with infant, using unaccompanied minor service, groups more than 9 people, passengers requiring special assistance or in special medical condition are not allowed to use Goair web check in. Airport check in begins 2 hrs before departure of flight. You can get it in email and then download into mobile. Why is that airline charges for web checkin to book window or aisle seat even less than 3 hr to depart ? I have a 2 year old kid. What ID proof can I take if I dont have his passport. Birth Certificate or Hospital ID or Vaccination reports Or Mother discharge summary etc. can be brought as alternative proofs of infant age and ID. PLease seek this information directly from airline. Is the School ID card(with photo) Valid proof for my 13 year old son who will accompany me(I have all my own Valid ids)? We used School ID cards till last year without any problem but since he will be above 12 now so just wanted to make sure? He does not have any other Photo ID. You have to speak to airline in this respect. We believe it shall be okay. Ticket booked in name of ' Dinesh Saxena ' but ID is in name of ' Dinesh Chandra Saxena ' . Is there any problem in check in ? Shall not be an issue but please confirm it from the airline. https://www.goair.in/plan-my-trip/web-check-in/ use this link to proceed further. Follow instructions to complete the process. Can not provide this information. Please contact the airline or the airport for this purpose. Not allowed. Ticket has to be cancelled and rebooked. I have confirmed ticket soft copy in my mobile phone. Do i need a hard copy print out also for check in. I am carrying my id proof with me. Yes, print outs are mandatory, for all travel documents. Original ID proofs need to be carried. It has to be taken in check in baggage only. You would be charged Rs 1000 or so for it, if airline decides that this item requires special handling. You are not allowed to club the check in baggage with the cabin baggage. You must keep these separate. Sir, I'm first time using and going to flight from Bengaluru to Delhi. I have not passport book. will we go without passport book traveling in our country..? You need passport only for international flights. For domestic flights, please carry one ID proof (in original). These could be a driving license, adhaar card, pan card, voter ID card. Please be more specific in query. How much luggage can be carried by one passenger in go air . I am having flight tomorrow morning & my luggage 10 kg and i want to web checking, please help me. There is option of Web Check In in the search engine box. You will have to enter the last name and PNR no. Yes. you can book it. 15 kg is check in allowance and 7 kg iss cabin allowance for domestic sector flights.